It's a fact that Blaze Bayley is an underestimated musician/singer who was captured in the IRON MAIDEN turmoil created by the departure of Bruce Dickinson. The IRON MAIDEN days were a two-sided coin for Blaze; first of all they gave him the opportunity to expose himself in bigger crowds and the chance to finally show some of his WOLFSBANE on stage skills and secondly he was put between the hammer and the anvil trying to make a stand sitting on the electric chair of IRON MAIDEN's singer. After his departure from MAIDEN Blaze had to follow a real difficult and most bumpy road that fortunately for us made it through and here we have the audio and visual proof of what happened in Switzerland's Z7 club on the 13th of December, 2008. The one disc DVD features the entire Z7 concert while the bonus disc was an exclusive addition to the very special release through the band's website and hence is not to be found in the regular release. The first thing you notice when "The Man Who Would Not Die" opens the gig is that the filming was done with the club's equipment. And this is means that you won't find multi-camera shooting or a high definition resolution. A closer look will reveal that the footage becomes blurry when the volume gets high during powerful drumming. The latter actually works in favor of the DVD since it manages to capture the band's energy pumped performance and especially Blaze's who delivers his passion storming the Swiss fans. The filming is almost primitive and the direction does not make things better looking like a compilation of fan-filmed footage. But again, you have to know that this concert marked the rebirth of a band who had to go through hell and back to release the excellent "The Man That Would Not Die" album featuring this extremely solid lineup. You can 'feel' their anxiety bursting out during "Alive" during which the band members makes a loud statement that they are here to stay. Blaze implements to the maximum his MAIDEN days training manipulating the crowd with passion giving the definition all the Metal concerts should have. After all, if a band does not connect with the crowd cannot be characterized successful no-matter how impressive the on-stage props and effects are. The bottom line is that this DVD is the band's celebration in reaching the point to release a studio album after all the troubles that would have crush many other average acts. 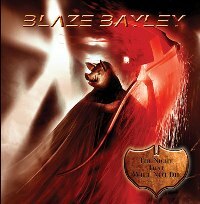 BLAZE BAYLEY made a "Leap Of Faith" and reached the other side with acceptable casualties and another excellent album entitled "Promise And Terror". This DVD can be purchased exclusively via the band's official site (http://www.blazebayley.net) so all the money can go to support them as they deserve it!